Rosella Ruth Cochran of 337 Grace Village Drive, Winona Lake, Ind., died Thursday, August 4, 2011 at 2:25 a.m. at Grace Village Health Care in Winona Lake at the age of 85. She was born on September 1, 1925, in Montana to Earl Cochran and Myrtle Gray Cochran. She grew up in Iowa and was a member of the Leon, Iowa, Grace Brethren Church. Rosella worked as a missionary for the Grace Brethren Church. In May 1942 she graduated from Mount Ayr High School, in Mount Ayr, Iowa. She graduated in 1946 from Broadlawns County Hospital of Des Moines, Iowa as a registered nurse. She then served in the U.S. Army as a nurse. In 1952 she went to Grace College and Seminary in Winona Lake, Ind., where she received her Bachelor of Christian Education in 1954. 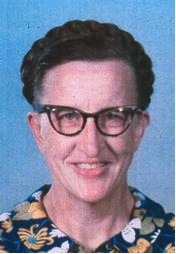 She served as a missionary in the Central African Republic from 1954-1986. She briefly retired, and then returned to the mission field in 1988 remaining there until 1990. Rosella resided in Winona Lake, Ind. No calling is planned. A memorial service will be held at a later date at Grace Village Retirement Community, Winona Lake, Ind. Burial will be held at Middlefork Cemetery, Redding, Iowa.